Just last week the BC Real Estate Association announced 2016 was a record setting year for home sales. Sales in the province were up 9.5% from 2015, a previous record. “Broad-based consumer demand driven by strong economic conditions, employment growth, consumer confidence and an expanding population base pushed home sales to record levels in many B.C. regions last year. Household debt levels have never been higher. Canadians owe $1.67 in debt for every dollar of income they earn. As house prices soar, citizens are forced to over leverage to get into the housing market. 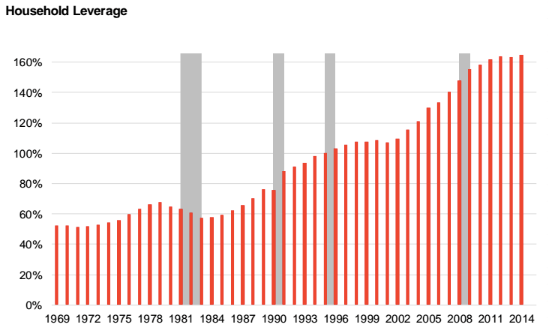 As a result, household leverage has never been higher. As household leverage hits record highs, home ownership also reaches new highs in BC, hitting a whopping 70%. With home ownership hitting new highs so too does unaffordability. 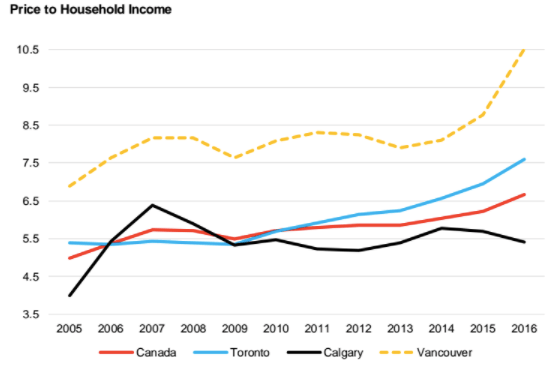 Price to household income in BC takes off. Employment growth has taken off. There’s just one problem, it’s the wrong kind of growth. 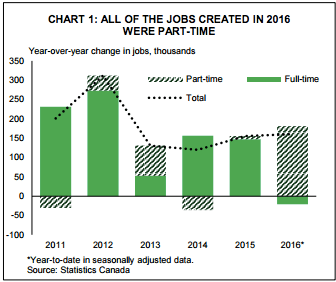 All of the jobs created in 2016 were part time according to a recent report from TD Economics, and of course we all know wages are stagnant. 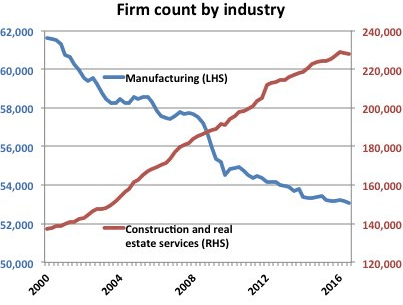 Solidifying TD’s caution, 77% of new business formations in the past year were in real estate services and construction. Not the rebalancing the Bank of Canada was hoping for. Sure, that could certainly drive prices up. But 40% in two years? Unlikely. As I mentioned in my post The Big Boom, housing completions in BC last year were 30% above the 5 year average. Multi family completions were 32% above the 5 year average and housing starts for 2016 also hit record highs. Stay up to Date. Get my best work sent to your inbox here. Next articleAre We In Denial?